Transcript of a talk given by 5 people who were involved in CIO organizing in the 1930s. This is an edited transcript of a community forum on “Labor History From The Viewpoint Of The Rank And File” held at Saint Joseph’s College in East Chicago, Indiana on March 24 and March 31, 1970. Doctor Charles McCollester of the Department of Philosophy of Saint Joseph’s College was general chairman of the forum. Speakers were introduced by Professor Neil Betten of the Department of History of Indiana University at Gary, and Staughton Lynd. The film “The Inheritance” was shown on the second evening, and each evening began with labor songs sung by Danny Mack, Bob Vuxinic, and Ed Zivich. Lyrm Dubek, a student at Saint Joseph’s College, transcribed the tapes. Harvey O’Connor took part in the Seattle general strike of 1919; was educational director of the Oil, Chemical, and Atomic Workers; and has written a number of books, including Steel: Dictator and Empire of Oil. During the early 1930s O’Connor lived in Pittsburgh and, together with Heber Blankenhorn and Harold Ruttenberg, assisted the emerging rank-and-file movement in the steel industry. George Patterson was picket captain at the Memorial Day Massacre in 1937 and first president of Local 65 of the United Steel Workers of America (United States Steel South Works, South Chicago, Illinois). Before the formation of the Steel Workers Organizing Committee in June 1936, Patterson built an independent union of 3,000 workers at the South Works mill. In September 1936 he was fired for union activity, and from then until he retired in 1969 he was employed as an organizer by SWOC and USWA. John W. Anderson belonged successively to the Industrial Workers of the World, the Socialist Party, and the Socialist Workers Party. A metal finisher, Anderson was a member of the Briggs (Detroit) strike committee in 1933, and chairman of the Fleetwood (Detroit) strike committee during the General Motors sit-down strike of January and February 1937. After World War II he was president of Fleetwood’s GM Local 15. He is presently writing a memoir of his experiences. Jessie Reese, a black man and an open member of the Communist Party, went to work at Youngstown Sheet and Tube in East Chicago, Indiana in 1929. Reese was a member of the Resolutions Committee at the first national convention of the Steel Workers Organizing Committee in December 1936. Two major themes emerge from these accounts. First is the vigor of rank-and-file activity during the period. Before the CIO was formed, George Patterson had built an independent union at South Works and Jessie Reese had organized a lodge of the Amalgamated Association at Youngstown Sheet and Tube. John Sargent describes how in Little Steel, because there was no contract and no no-strike clause, wildcat strikes in particular departments continued for three or four years after the Memorial Day massacre in 1937. And John Anderson tells how the contract which settled the General Motors sit-down strike sacrificed the shop-steward system. I would like to say something about the kind of history we're going to be doing here tonight. One of the songs from die 1930s is called “Talking Union”, and begins: “If you want to form a union, here is what you've got to do : You've got to talk to the fellows in the shop with you.” The song says that we all know from experience that organizing begins with talking. People talk together, then they act together. And after we act together we talk about what we did. We come back from the picket line to the union hall, and we evaluate our action. What happened? Sometimes, as you know, in a confused demonstration, each person sees only part of the action, and you have to wait until you're all together again to be able to put those pieces together and be sure what really happened out there. What happened? Was it a success‘? Even it it was a success, how can we do it better next time? This kind of talk —talking together after an action about what that action meant- is history. History is not something in books. History is people remembering together what they did. Everyone who has ever been in a strike or demonstration knows that the newspapers, even when they mean well, never tell it quite like it was. It’s the same way with history books. The point is that the people who know most about something are the people who personally experienced it, the people who can say ‘I was there.” There are an awful lot of these people - an awful lot of history - in this room tonight. Now why are we doing this kind of history? One reason is this: I happen to be 40 years old, halfway between the men and women in their 60s who built the CIO and the young people in their 20s who built the civil-rights and peace movements in the 1960s. And maybe because I'm halfway between these two generations, I feel very deeply the anguish of the older people who can’t quite explain to the younger people —often their own children -- just what it was they experienced, and of the younger people who may know that their dads and moms were involved in putting together the CIO, but still can’t quite explain to their folks the newer type of movement they are into. And so young people grow up and leave a community like this one without ever really knowing the history —the tradition of struggle -—of the community they are leaving. I think we can’t afford this particular kind of generation gap. We need to ask ourselves whether we can't find a definition of “what it means to be a worker” which includes both father and son—both the worker who is in the steel mill and the worker who is a teacher in school. We need to ask whether there is a definition of popular struggle broad enough to include both a student strike and a work stoppage—both a sit-down strike in a plant and the occupation of a building in a university. A kid who is thrown out of school for taking part in a peace demonstration and a worker who is canned for taking part in a wildcat have a great deal in common, I think. Another reason that we need this kind of history is that labor is stirring again. Once again rank-and-file unionists are rejecting the so-called statesmanship of labor leaders. Once again idealistic young people are leaving the colleges and trying to lend a hand. Once again unemployment is rising and real wages are going down, so that working men and women feel that their backs are to the wall and that they're struggling simply to keep what they already have. Once again the President of the United States is using troops as strike breakers. Once again working men on strike have determined that there is a higher law than a court injunction and that the human rights to a living wage and a steady job are superior to all property rights. Once again the word has gone out to organize the unorganized. Yesterday afternoon, not a 15-minute drive from here, I attended a meeting of working people, mostly older women, at Saint Margaret's Hospital in Hammond. Their average wage last year was $3187-— $1900 less than the average in Lake County hospitals, which itself isn't enough to live on. They want a union, they face an injunction, and they will probably go on strike. Once again facts like these kindle both an indignation and a spirit of solidarity, so that we begin once more to see workers in one industry on the picket lines of another. And once again ordinary men and women begin to wonder why the coal and the oil and the open hearths should be sources of profit for men of power whom none of us have elected, or why schools are not better in a county of wealthy steel mills, or why some men of 60 work midnight shifts while others give dictation in air-conditioned offices. In so many ways the problems of the ’30s, the spirit of the ’30s, and even the songs of the ’30s are with us again. And so our forum asks the questions: “What was it that led four million persons to join tine CIO and half a million to stage sit-down strikes in 1936-37? Why did that militancy fade away so quickly? How did rank-and-file groupings try to keep that militancy alive? What can we do to revive that militancy today? I really did like the way you started off this meeting with song. It reminded me that when-I was a youngster working in the logging camps of Western Washington, I’d come to Seattle occasionally and go down the Skid Road to the Wobbly Hall, and our meetings there were started with song. Song was the great thing that cemented the IWW together. Wherever you had a Wobbly Hall you had people singing and enjoying themselves, and that song “Solidarity Forever” was of course a Wobbly song from way back: 1917-18-19, around those years. In the words of that song was condensed the philosophy of that organization. Later, of course, “Solidarity Forever” was adopted by the CIO as their official song, and in the Oil Workers it’s the same. But I’m here to tell you about the early days of the rank-and-file movement in the Steel Workers Union in Pittsburgh. I lived in Pittsburgh from 1980 to 1937, and it was one of my unforgettable experiences to have lived in Western Pennsylvania at the depth of the Depression. I suppose the Depression was worse in the steel mills than in any other industry, and was certainly at its worst in Westem Pennsylvania. I remember we lived on a hilltop in Pittsburgh, and the natives used to tell me you could see Pittsburgh for the first time in history. Usually, you know, it was‘ blotted out with smog and smoke, but during the Depression not a mill was running. I would go out as a labor newspaperman to steel towns such as Duquesne and Homestead up and down the Allegheny, Monongahela, and Ohio Rivers. And I can never forget, at Homestead, good old Carnegie Steel, “the friend of the steel workers”. The mills were shut down and there was no Social Security in those days, folks; there were no unemployment benefits; there was no nothin’. Except Carnegie Steel every Saturday had baskets for its employees. (If you could call them employees any more: I mean they didn't have no jobs.) There’d be a lot of moldy old bread and some sour old bacon and some flour with maggots in it. It was a lot of junk being handed out, out of the goodness of the heart of Carnegie Steel, to keep these people alive till the time came when they would be needed again. We couldn't afford to have them die on us, you know! They had to be available when the Depression was over. There was a very-curious labor situation at that time. There was an organization known as the Amalgamated Association of the Iron, Steel, and Tin Workers, and one of its main locals was a horseshoe factory in Buffalo which made not only horseshoes but also nails. This was about the extent of organization in the steel industry, aside from a few old tin mills. The gentleman who ran this union was named Mike Tighe. It was always said that Mike had a deal with Carnegie Steel and the rest of them not to organize, but to kind of lay off, and that there should be certain perquisites for them. They had a little hall in Pittsburgh for the union officers, but they had only a few thousand members. And during this horrible period when the mills were shut down, the union was pretty-well shut down too. And I think maybe Mike Tighe went into hibernation during that period. He had nothing to do. He didn't have much to do anyway, but he had much less to do when the horseshoe mill shut down. So in 1933 along came the New Deal, and then came the NRA, and the effect was electric all up and down those valleys. The mills began reopening somewhat, and the steel workers read in the newspapers about this NRA Section 7A that guaranteed you the right to organize. That was true, and that's about as far as it went: You had the right to organize, but what happened after that was another matter. Allover the steel country union locals sprang up spontaneously. Not by virtue of the Amalgamated Association; they couldn't have cared less. But these locals sprang up at Dlquesne, Homestead, and Braddock. You name the mill town and there was a local there, carrying a name like the “Blue Eagle” or the “New Deal" local. (If you can’t remember what the “Blue Eagle” was, that was the bird that took us out of the Depression.) There was even an “FDR” local, I think. These people had never had any experience in unionism. All they knew was that, by golly, the time had come when they could organize and the Government guaranteed them the right to organize! In Homestead the steel workers took this seriously. But Carnegie Steel owned Homestead. There were no halls. It’s difﬁcult to organize when there’s no place to get together to organize. The situation became so notorious that Madame Perkins, who was Secretary of Labor under Roosevelt, finally had to come to Homestead and hold a meeting there for the steel workers. Where did she hold it? The only free territory in Homestead was the steps of the local post office; that was Federal property. So she stood there to deliver a speech to the steel workers and help them get going. The trouble with Section 7A was that while it guaranteed you the right to organize, it didn't guarantee you the right to anything else. The people got together in the Rank-and-File Movement almost spontaneously, you might say. The Amalgamated Association chartered these locals. Mike Tighe was willing to have the per-capita coming in. (You folks know what per-capita is: It’s what keeps the bureaucrats going.) And so the per-capita began to come in and there had to be a convention. The Amalgamated Association called a convention, and in poured these people from all over Western Pennsylvania, Eastern Ohio, West Virginia. They hardly knew what to do: They knew what they wanted, but they'd never had any experience, and Mike Tighe wasn't very likely to help them out much. As a matter of fact Mike Tighe was appalled, because if it was going to be a democratic union, then these Rank-and-Filers would run it. And you couldn't permit that; that could be the end of Mike Tighe. At the time of the convention there was a chap at the University of Pittsburgh, Carroll Dougherty, who had a bright young student in his class and assigned him to come down to the convention and help the Rank-and-Filers get started. We were working together listening to the Rank-and-Filers putting together the resolutions they wanted the way they wanted them and getting things going. Of course the resolutions carried; it was a grand success; and the Rank-and-File people went home and nothing much happened. So we entered a new period in the history of the union—one in which Mike Tighe began expelling these locals because they were exercising their autonomy and doing what they could. Out of this really-anarchic situation that existed in ’33 and ’34 came, of course, the Steel Workers Organizing Committee. Somebody had to come in there with know-how to get the organization going. I must say the miners were perhaps the most important. They did understand unionism, even though they were poorly organized at the time. They had been organized in the past, and they were reorganizing all over the country. It was at that time that John L. Lewis decided the time had come tn establish the Steel Workers Organizing Committee. And in order to build up this organization he had to appeal, of course, to these Rank-and-File locals that were scattered all over the country, and I suppose all around this part of the country. Around the Pittsburgh region organizers came in mainly from the miners’ union. There's an interesting little sidelight on that. When John L. Lewis wanted to go into steel towns like Duquesne, Homestead, and Braddock, literally, as I've said, there were hardly any people in these localities who understood organization except for one particular set of people — the Communists. Now you may say: How come there were Communists around? Well, in the Western Pennsylvania region there were all kinds of literary and dramatic societies based on ethnic groups: Hungarians, Yugoslavs, and so on. They had their dramatic and singing societies and the like, and in these societies there was a strong bond of unity and solidarity. And it was into these organizations, many of which were dominated by the Communists, that John L. Lewis went for organizers to help those miners who had come in. The miners didn't know anything about steel, and so he had to have some steel people. And it’s one of the oddities, you know, of organization that John L. Lewis used the Communists to organize the Steel Workers Organizing Committee, and when he had it going pretty well he threw the Communists out! He was through with them. So that was some of the early history of the Union. I met Harvey many years ago; he doesn't remember me because in those years we met many strange people. Isn't that right? We’re not so strange, however. I came here when I was 16 years of age and went to work in South Chicago at the South Works. I became a roll turner's apprentice and went to night school at Englewood High. I worked 10 hours a day in the mill and went four hours an evening to night school. (Self-educated.) I graduated from high school and served my apprenticeship all at the same time, and it wasn't easy for a young fellow. The first job I got was in a blacksmlth’s shop, and we got $5 a day; that was 50¢ an hour for 10 hours. But I quickly got over trying to be a blacksmith; I wasn't built for it. So I went into the roll shop and became a roll turner, and I dropped down to 29¢ an hour; that was $2.90 for a 10-hour day. Of course every six months you got a raise. At the time that the steel workers began to get interested in the CIO, we in the roll turner’s trade began to form our own union, and I became the international vice-president of the United Roll Turners Of America. This was my first experience with unions. I wasn't too interested in unions other than to get more dough; I was a typical steel worker. We had just come through the Depression. Those Depression years were terrible. I almost starved to death. The reason I got interested in the union was that I got married in the middle of that depression, and then along came my son and I didn't have enough money to buy a bottle of milk. Well, we got interested in the union not because of the steel workers themselves but because the steel-mill people came into the mill around 1933 and handed us a piece of paper. We looked at it, and it was called “An Employee Representation Plan”. Now the Employee Representation Plan was the company-union plan. It was based on the fact that we had the right to bargain collectively. The company drew the whole thing up, and the workers in the various departments elected representatives of their own. I looked at this paper as a young lad and said this thing could never work, because it said right at the outset that there would be five members from management to sit on a committee and five members from the union -—the company union — to sit on the committee. I asked who settled the tie, and of course I found out management did. So you see how useless it would have been. I talked to the fellows in the shop, and I talked faster than the others about unions. (I’d heard my dad talk about unions in the Old Country.) I said: “I don't think this thing is any good.’ So they elected me to be their representative! And the first thing I did was begin to destroy this company-union idea. I believed in the legitimate form of union. I got in touch with this Amalgamated Association through my craft union, the roll turners, and they wouldn't have anything to do with us. Leonard was the secretary. He wrote me nice letters, but never came to see me or invite me to come down and talk over joining with them. Then, strange things began to happen. One night I came home —I'll always remember as long as I live; it was Lincoln’s birthday about the year 1936. — and I walked into the house and there were two big fellows sitting there talking with my sister. They had a wonderful opportunity for a job for me. Now I was working in a mill as a roll turner, making pretty-good money for that time. When I got to talking with these fellows, I found out that they wanted to hire me as a spy. So you see I became very-quickly acquainted with labor espionage. We were trying to form a legitimate union, and these people invited some of us to come spy. Of course I turned this down and told them had nothing much to offer them. We tried to disband the company union, and we formed what we called the Associated Employees. This was just workers like myself attempting to do something by way of getting into a legitimate union. The Amalgamated Association was lying there and wouldn't do a thing for us, never even offering to talk to us. So we formed an independent union. One day we read in the newspapers that they were trying to do the same thing down in Pittsburgh. So I was elected to go down to Pittsburgh and talk matters over with the fellows who were attempting to do that. And I got to talking to a man named Johnny Mullin who asked me if I knew of a certain man named Hemingway. And I looked at him and said “Yes. What do you know about him?” “Well,” he said, “I work for him.” I said: “You mean you're working for that spy?” He said “Yeah.” He had been approached by these same spies down in his plant in Pittsburgh, and he was taking the money. He was giving them the reports they wanted, and then he was turning them over to Clinton Golden of the National Labor Relations Board. We found out that Frick, vice-president of US Steel, was the company man in charge of the spying. Mullin and I went down and testified before Senator LaFollette’s committee, and there we revealed the beginnings of labor espionage in the steel mills and in other industrial plants. That was an interesting time in my life, I assure you; but little did I know that there was more to come. I became president of the Associated Employees, and then we heard about a man named John Lewis who was very interested in trying to organize the unorganized. I wrote him a letter and said we had an independent union that would like to join up. He wrote back and told me if I held my short tail in he'd be down there in the near future and he’d send a man by the name of Philip Murray. So I got to meet Phil Murray and found he was a Scot born about a mile from where I was born, and we got along pretty well. He was old enough to be my father. He was a United Mine Worker and could tell me more about unions in America than anybody else I knew, and I began to work very closely with him. One day he said to me: “I'd like you to come down to Pittsburgh and do a little testifying against ‘yellow-dog’ contracts.’ A company had quickly signed a “yellow-dog’ contract with a company union that still existed. . .the remnants of it. So we appeared before Madame Perkins and testified against ‘yellow-dog’ contracts, and these contracts were ruled illegal and the company unions were disbanded. Just at that time the Steel Workers Organizing Committee began their drive. But I was fired for doing this. I had 12 years in the steel mills . . . it was the only place I had worked . . . and now I was fired. But I was quickly picked up, thank goodness, by the Steel Workers Organizing Committee, and for the last 33 years of my life I've been working as an organizer for the United Steel Workers of America. In June 1936 we started the drive to organize the steel workers in this area. I had a lucrative place to go; I had all these company unions throughout the steel mills, and I knew nearly every one. I would go to these people and get them to start joining the Steel Workers Union. Of course many of them were joining up at their own volition; I didn't do all this by myself. I was just an organizer. By that time 1937 had rolled around, and we had already gotten a contract with US Steel (Carnegie-Illinois at the time). When we tried to get a contract with Republic Steel on May 26, 1937, the workers went on strike because Tom Girdler said he would rather dig potatoes than ever sign a contract with any labor organization. So the strike was on. I understand you want to hear just a little bit about the Memorial Day Massacre. I was there. I was there on the Wednesday night when the strike started. I watched the police march around in their military formation. They were very-well oriented. And toward 11 p.m. they marched out all of a sudden and broke up our picket lines, and the next thing I knew I enjoyed being placed in jail for the first time. I was in jail many times after that, and I never found anything too wrong with jail except the bed bugs, which I didn't like. Otherwise I got along fine in jail. I always carried an extra $50 bill hidden away somewhere so I could get myself out. I learned that trick very early. (But you know, the Wobblies, they didn't have a $50 bill. But we young steel workers were getting wise and saving our money a little bit by this time, because the Depression was beginning to get over with and we were working a little steadier.) So I ended up in jail on the first night of the strike with about 18 other organizers. We got out immediately the next morning, charged with disorderly conduct. Thursday I began to organize the picket line and we went down to picket, and they wouldn't let us picket. Mayor Daley . .Mayor Kelly. . . . I've got to watch that, Daley and Kelly: There's no difference, you know. . . .Mayor Kelly said at the time: “Yeah, you can picket all you want.’ But if we went down there the cops would beat the hell out of us. So we kept trying to picket and we got put back in jail. On Friday night we got real angry. We marched, and we were determined that we were going to picket. We met the police again. This time they really took a swat at us, and they were beating the hell out of everybody in the front lines. If you were in the front you were pretty lucky if you could get away without getting clubbed a little hit. Then they fired a few shots in the air, and that scattered us. There was no riot. We ran like hell. The cops were after us. They always say we riot. We never riot. We wanted to picket, and they won’t let you picket; so they beat you up and then they say you rioted. This is the fact. The cops make you riot. "They riot against us, always. I know it; I've been there too many times. I'm always well-behaved. I might talk to them, but that’s about all. Anyhow, they chased us and they beat us again. Well, he was standing there -Kilroy was the man. —and he was reading a very-official document asking us in the name of the people of Illinois to disperse; and as soon as he said that he put the paper down and all hell broke loose. They began to shoot us, club us, and gas us. . . 10 people died while 68 were wounded. . .and we don’t know how many got hurt in all. It really was hell on that field. I ran back with the rest of them, and I got mad. I could see the cops there shooting away with their guns. At first I thought they were blanks -I really did. I could smell the gunpowder; I’ll never forget it. And then I began to see people fall. I saw a boy run by, and his foot was bleeding. Then it dawned on me: They were shooting real bullets. This was for keeps. They didn’t stop shooting and killing till an hour and a half later. They were chasing people and picking people up. It was about a week later that I was picked up by the police, and this time I really got the treatment. I went in and was held incommunicado for four days and four nights. You know how they do it: Every 24 hours they move you (They don’t need to book you. ), and all the time you're being questioned. My wife didn’t know where I was at; nobody knew. I just disappeared. They picked me up on 95th Street at Torrence. I was going over to a meeting at the Burnside Steel Foundry, where I was organizing at the time. I never got there. How did I get out of it? Well, after about the third night there was a boy in the cell next to me who had been picked up for drunken driving, and his mother came down from Joliet to get him out, and I asked this lovely lady: “Would you do me a favor?’ She said: “Well, you look like a nice fellow.” And said: “Yes, I am. I’ve been in here for four days and four nights, and I’m trying to get word to my wife.” And she said: “Give me your telephone number." And I told her. And she called my wife. When they got the information from my wife, my lawyers got a writ of habeas corpus and produced the body, which was me, and we were put out on $50,000 bond. We were charged with exactly the same thing these seven fellows were charged with: conspiracy to commit an illegal act. They did it then, they’ll do it next year, they’ll do it any time. The police will react the same way, the mayors of Chicago will react the same way. Every time you put on a demonstration, always take for granted that this is what’s going to happen. I haven‘t seen it change from the Haymarket days to that Memorial Day to the 1968 National Democratic Convention, when the police are faced with a plain group of citizens and are stirred up by the newspapers and foolish propaganda. I don't know what we can do to teach policemen that we’re law-abiding citizens who are walking on the streets; we’re demonstrating for something right. My heart bled the night of the Democratic Convention. You know these things happen, and you'll have to be prepared to face them. We were ready to do these things : We stood up and we organized the steel workers all over the country. Some people ask: “Was it worth it?” Of course it was worth it. We got a contract at Republic Steel. Well, anyhow I briefly told you my experiences, and I haven’t even touched on half of them. But I know that you’re going to listen to a very-interesting gentleman from the Auto Workers. I know what the sit-down strikes were, because we steel workers also began some of our unions that way. And some night maybe I‘ll tell you the story of the Fansteel strike in Waukegan. That was a real sit-downer, and I happen to have been in that in my younger days. That Memorial Day was just one of the things we went through, and the sit-down strikes marked the beginning of the Auto Workers. My entry into the labor movement in January 1933 was one of the accidents of my life. I deserve no special credit. Most things in life are more-or-less accidental. I was able to get an education by working my way through high school and college. In 1931, when I graduated from the University of Wisconsin, only 10% of my class were able to get jobs in their professions. The other 90% had to make a living any way they could. I had learned the metal-finishing trade back in 1926 at Seaman Body in Milwaukee. In December 1932 I found it necessary to go back into the shop and work at that trade. There were millions unemployed at the time. 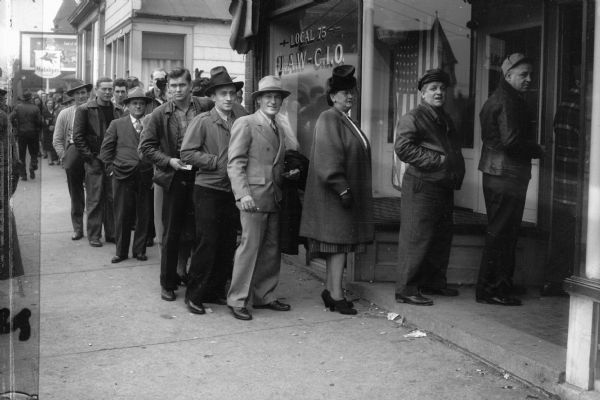 Many of these unemployed went to employment offices at 4 a.m. and stayed until they closed at night, hoping to get a job. At that time I was 27, and the employment men recognized that I could stand the work expected of a metal finisher in those days. With all that unemployment, you wouldn't think they would work 10, 12, and 14 hours a day seven days a week. I went to work at the Dodge Hamtramck plant December 2, 1936, and I worked every day, including Saturdays and Sundays, 10, 12, and 14 hours a day. At seven o’clock on Christmas Eve they laid me off, saying: “We’ll call you when we need you.’ I had been paid at 52¢ an hour. In 1929 I earned $1 an hour and sometimes more. But wages had been cut 50%. Since we couldn't expect to work more than four or five months a year during those Depression years, I had to look for another job. This statement provoked the men into walking out as a body, not as individuals. They had no organization; they had no one to speak for them. There were several hundred of them milling around in the street wondering what to do. I had seen such situations before, and the men generally stayed out a few hours or at most a day or two, and then went back to work. Because of my education I felt obligated to the men to speak for them. I got on a car fender and suggested that we demand the 52¢ an hour promised on our hiring slips. Leon Pody, Lloyd Jones, and I were chosen to call on M. L. Briggs, the vice-president of the Company. We went to the sixth floor, where the offices were located. After about 10 minutes of argument, Briggs agreed that we should be paid the 52¢. I said: “How about putting it in Writing?’ He said he wasn't going to put anything in writing. ‘Well,’ I said, ‘anything that’s not worth putting in writing is not worth going out to the men with.” We didn't know whether or not he would live up to his agreement, and so the strike began. We knew some men were working as much as 20 hours a day while tens of thousands of others were looking for work. Some were called to work day after day, and then sent home because there was no work. They were told: “Come back tomorrow, and we'll see if we have anything for you.” Men were paying for their streetcar fare and lunches, and yet weren't making enough to afford either. This went on for years during the Depression. The newspapers publicized the strike as communist-inspired. It was true that Left-wing groups—communists, socialists, Wobblies, and other Leftists -—often were the inspiration and furnished the leadership of most of those strikes. When I saw the Mayor, Frank Murphy, using the Welfare Department of the City of Detroit to force the men to go back to work and the people on welfare to become strike breakers (both city and state police under a Democratic mayor and governor), I came to the conclusion that these officials were strike breakers and not on the side of the workers. The strike was lost after about three months. It wasn't lost completely, though, we had gained valuable experience from the strike, and we made up our minds that we would carry unionism wherever we went. I was blacklisted as a result of the strike; but I could always change my name, and I did. I was hired back by Briggs to work at its Luchner plant, where experimental work was done and about 200 men were employed. This was a good job. Here I learned that as a result of the strike the wages of metal finishers had been raised to 60¢ an hour-- a big raise for those days. We worked eight hours a day five days a week. The strikers didn't get credit for all the improvements in wages and working conditions, but it gave me a lot of satisfaction to know how much good the strike had done. There had been work stoppages at other plants in the city. We were told that there had been a meeting of the employers at which they had decided to raise the wages of metal finishers to 60¢ an hour and those of workers in other job categories accordingly. After I had done experimental work for two months, I was told to go back to the Mack Avenue plant, where I was identified and fired the first day. But in a few days I had another job with Murray Body. Here the IWW was organizing the workers. I was biased against the IWW, and for some time refused to sign up in the union. I had formed my opinion of it from press reports which accused it of committing acts of violence to gain its objectives. But finally Frank Cedervall, the IWW organizer, told me to read Paul Brissenden’s history of the IWW, and after reading this book I changed my mind. From then on I gave less credence to what the press said about labor. The Murray strike had been in progress about a month when the Detroit police picked me up one afternoon. They then drove down to the picket line where Cedervall was and picked him up. When a lawyer and a judge came down to the police station to have us released, the police threatened to throw them in jail too! Believe it or not we were charged with violating a law passed in 1862 against the Southern states in the Civil War: We were charged with trying to overthrow the Government of the United States! We represented only a few hundred people. We were arraigned and held on $500 bail. In 1933 $500 cash bail was hard to come by. We were held in jail for more than a week. In prison you really get to understand what this government is like. It makes a deep impression on your mind. While I was there two other strikers were brought in. They were from the tool-and-die strike called by the Mechanics Educational Society, and had been caught with sling-shots and ball-bearings in their car. Many of us in the labor movement who held to our convictions spent time in prison. When it came time for our trial no one appeared against us, and the charges were dropped. The purpose of arresting us and holding us in jail had been to break the strike, and in this they were successful. During the next two years, from '33 to ‘36, I spoke in front of factory gates and at strike meetings for the IWW. On November 24, 1936 I got a job at Fleetwood Fisher Body in Detroit. Hearing and reading about the activities of the CIO, I decided to begin organizing for them. The IWW was no longer active in Detroit and had no organization there. By the middle of December 1936 I had organized a nucleus of the UAW-CIO in Fleetwood. They already had a strike in progress in Atlanta, Georgia, and other strikes soon followed. At Flint, Michigan we held a conference of GM workers at which many GM plants were represented. Soon we had a nationwide strike. Before the strike we met with the Fleetwood plant manager, but he had no authority to settle any of our grievances. On the day of the strike, January 5, I was scared; my knees were shaking in spite of all my experience. That morning the plant manager stood on one side of the aisle near the exit and I stood on the other side. I was urging the workers to go to the cafeteria, where we were going to hold a meeting to organize the sit-down strikers. We remained in the plant until January 16, when we were asked by the UAW leadership to leave. This sit-down was a great experience --the best education that a worker could get. This demonstrated the power of labor. Many of us were not satisfied with the settlement. We had been sold on the idea that we should have a shop-steward system throughout the Corporation to represent the workers, and this wasn't part of the agreement. I spoke in support of the shop-steward system, arguing that we should stay out until this system was recognized. John L. Lewis, Governor Murphy, and the UAW and GM officials had agreed to the settlement. The Union officials felt that this was the best that could be gotten at that time. It was the kind of beginning that enabled us in the next few months to organize hundreds of thousands of workers at GM, Chrysler, Briggs, Packard, Hudson, and hundreds of smaller plants. The GM strike was the great push that established the CIO, and I’m proud to have participated in that great struggle. I hope the book I’m writing will bring out clearly the militant workers’ viewpoint. I spent the best 30 years of my life as a worker in the Fleetwood Fisher Body plant. I had many disagreements with the top leadership of the UAW. I know that the histories that have been written about the UAW have been written from the viewpoint of the labor bureaucracy and the Democratic Party. These histories are biased in their favor, and are largely false. You are looking now at living history: not reading from a book, but listening to a man who took part in the history of building a trade union in steel. I went in, and the first thing I met was old Jim Crow. They intended to run me out. So they said to me: “Well, we don’t take colored people in here, we haven’t been taking colored people; but since you’re a steel worker and we need the trade union built, we’ll give you a chance. But remember one thing: You’ll have to organize to stay here.” I then them “That's my business coming here —to help organize the union.’ One of the secretaries said to me: “I love Negroes, but I like to see ’em in their place.’ I didn't say a thing, because the organizer had told me to take it cool: “Don’t lose your cool, but stay there.” So when it came to my time, I took the floor. I said: “I met a brother here in this union, and he gave me something to think about and something to do. He told me he liked colored people, but he liked them to stay in their place.‘ I said: “Brothers, I agree with him. The place of black people is in the labor movement and officiating in their place, and I'm going to see that everyone out here can be put in his place.” I said: “Every working man should know his place. I don't know what place you belong to, but my place is in the labor movement. Is that the place you were telling me you wanted me to stay in?” So that went on. A few days later, they said to me: “We heard the Reds were coming in here, to take over the union. Stay away from the Communists; stay away from them.” I didn't say a word. I waited till my time had come, and I got on the floor. I said: “Mr. Chairman, fellow delegates to this union: I didn't come here to tell you how good communism is, I came here to help you build a union. I feel that if a man’s in jail, and you have a piece of pie in your hand and tell him how good it is when he needs liberation, it is foolish, when you can’t enjoy it under the present system that we live under.” And they left me alone, and next time they said: “This brother, we're going to make him president of this local union. He's able to take care of stuff, and the rest of us don't.' And they said: "We’re making you president. How about it?” There were four of them. I said to them: “Well, listen, you white follows say you are free. Why do you want to put such a load on my shoulders ? " They said: “Well, you’re the man for it; you can do it; you can do a good job. You're president of the union —-we’re going to nominate you.” So they elected me, and l took it. I reported to the organizer and told him I’d done a good job, and he said: “Tell me what you did.” I told him. I said: “They hit me in the face, they hit me everywhere, but I hit back. And they hit me with communism, but I told them I hadn't come there to tell them ‘how good communism was, since they couldn't enjoy it anyway under the present society that we live under." And he grabbed me and kissed me -first time I'd ever been kissed by a man in my life, but it was a true kiss, it wasn't a Jim Crow segregation kiss, but it was a kiss of an honest brother. I went back to the hot strip and told the brothers: “Well, we got 3¢ on the hour, and the foreman a better job with a vacation.” And there was an iceman, whose name was Bill--Bill Anderson. He was a big, heavy, strong fellow. And he said: “Bring ‘em on up to the union, and we're going to initiate them—-every man; we're going to make a strong union.‘ So I brought them into the union and we made a talk --and how they got it. But the hot strip didn't get anything. They just gave to the pickle. So everything was hot on the hot strip. How were they going to get their increase? The hot-strip boys were coming into the union. They were afraid of the union at first; everybody was scared to come in. But they were going to join the union. I had a meeting in East Chicago-Indiana Harbor. A candidate by the name of Mr. Fred Higgins was running for Lake County judge, if I remember right. And that was my smokescreen: I could bring forth my union —what my union was doing for the politician; so I could call for membership. I think I had about 2,000. Then I was called in on the carpet. Mr. Griffin called me in and said: “Hey, I thought you were satisﬁed. What are you doing now? I heard you got to be president of the Amalgamated Association, and you’re calling mass meetings.” And I said: ‘My viewpoint, Mr. Griffin, is politics.” “Oh, that's all right,” he said; “go ahead.” But I didn't tell him what kind of politics I meant. A hunger march came through led by a black man named Claude Lightfoot. So I got my gang ready, getting some of the people in Gary ready to meet the hunger march, all those who could go to Washington getting aboard the train. The train was moving in for unemployment insurance, social security, and $6 a day with a five-day week: Those were the demands of the Communists in that day. Arnold Johnson, the Republican mayor of the city at that time, said: “No hunger march is coming through Gary! ' Well, Claude got an average number in his march (which looked about a mile long), and stopped about 15 minutes and said: ‘Arnold, we are here! And we are on our way to Washington for unemployment insurance, social security paid by the Government, and five days’ work six hours a day.” That’s the way it was. We had a “rump” convention of the old Amalgamated Association in Pittsburgh, but we didn't have any money to send people there. We had to have $100. One of the brothers there who Red-baited so bad told me: “I want you to go to Communist Party headquarters and borrow $100." And I said: “No, I won’t. I’m the president of this union. I‘m going to let the delegation go, and you're going to be on the committee.’ “Well, Reese,‘ he said to me, “I thought you knew him.’ I said: “You can get acquainted with him! ” So sure enough, they went on and borrowed $100 to go to Pittsburgh. They never did pay it back. They couldn't give social affairs to raise money because there was so much racism in the outfit. They were scared of a black and white social affair, but later on they began to see that there wasn't much difference, and they had to do whatever they could to get money. In the year 1935 a resolution to organize steel was introduced at the AFL convention. It was a knock-down, drag-out fight. John L. Lewis and Bill Green (Bill Hutcheson) got to fighting over the resolution, and I understand that Lewis knocked Green down and came out with a CIO industrial-union council, ready to organize. Well, brothers, we rolled on, building steel. I helped to organize Youngstown, and we had a strike in 1937. Republic Steel was scabbing. So we went to South Chicago with truckloads of people — working-class people. And we started our picket line like any union would be doing, and brother George Patterson was leading the strike. And while walking along I heard guns, and I thought: “Oh, oh; they’re shooting blanks.” I said: “Keep moving, folks; they ain't doing a thing but shooting blanks. File up, march! " But then I began to see people drop. There was a Mexican on my side, and he fell; and there was a black man on my side and he fell. Down I went. I crawled around in the grass and saw that people were getting beat. I'd never seen police beat women —not white women. I’d seen them beat black women, but this was the first time in my life I‘d seen them beat white women -with sticks. There was this woman carrying a flag in her hand, and they hook the flag away from her and began beating her with the flagpole. I thought: “I’m here with nothing. I should have brought my gun.” But I didn't get hurt; I got out of there all right. US Steel signed a contract. And I think the steel plant where we were working signed some kind of state agreement. And later on we also got a contract. I had always said I wanted a union that would be a watchdog for the working class and guard its interests. So I always called our union the watchdog. If I ever had a chance I was going to turn my dog loose on the steel corporation. I always looked at Mississippi and Alabama. The lynching, Jim Crow, and segregation always stayed on my mind: How could we stop it? My aim was to do it. I want to say, friends . ..and I’m not going to take up more of your time. . .I had to give it to you like it is. In 1935 the Communists built the union. After we got the union built, something happened to John L. Lewis, and Mr. Philip Murray carried out his aims: He fired every Communist organizer. He made an agreement with the steel trusts, it seems to me, that he would fire the Communists; and that's what happened, and the union’s been going back, back, back ever since. It doesn't open its mouth. Today we have in our unions a pet dog--what you might call a pet company dog-—led by the caretakers; and the caretakers are the leaders of our union. And our dog is being fed Red-baiting and his teeth have been pulled out — That’s the strike clause. -—and your dog don't bark no more for you. So the only thing you can get to win now is a cat; and it’s got to be a wild cat, organized as a blanket matter. You've got to use blanket cover to keep from being exposed. Your so-called leaders are the leaders of the industrial pet dog. Your dog don't bark at no misery; your dog won’t bark no more-he can‘t hear. Makes no difference how many people they kill, your dog don’t say nothing; he ain't the dog of 1937, when that dog turned loose nine boys - the Scottsboro Boys — and freed Tom Mooney. Your dog- What's the matter with your dog‘? I couldn't stay in that union, pay dues, and keep quiet. They'd have to do something about things. There's no justice, no justice! And we sit down with a big trade union—with intelligent people (people who are educated, they say); and you don’t hear nothing and you can’t say nothing and you can’t sec nothing- You can’t see those people getting killed. They have declared war on color—and not just on one color, but on all color from the Kennedy's to the Kings to the black ghettos to the Black Panthers to the mine workers; and they're now dancing on the doorsteps of Asia, and your dog don’t bark. Because you don‘t have anything but the pet dog of the steel trusts. Now I hope tonight that you do something about things before you leave here. If you came to hear the history of the union, the way it was organized then is the way you’re going to have to do it now. You have no leaders: Your “leaders” don’t say nothing; they’re scared. Freedom is the jail house —that’s the way of freedom. It ain't worth being free if you’re not willing to go to jail for it. But your leaders ain't going nowhere if they can keep from it. You‘re going to have to organize and fight for peace and freedom, and against racism. That's the worst enemy the working-class ever had -- racism. To organize that black boy out there today you've got to prove yourself to him, because he don‘t believe nothing you say. He says: “Racism is your thing; do what you want with it.” But I say it's our-thing; we've got to do something with it; we've got to fight it and bring that boy back, just the way he got; out there by himself. There's no one man can win a revolution. You can’t advance ahead of the rest of the working class. He's very impatient; he’s not ready to wait. He feels that if I shed blood for the power structure, I can shed blood for myself. I agree with that. But I don't agree with his shedding blood by himself. Well, friends, I thank you for letting me have this little few minutes’ talking. Maybe I over-talked my time, but that’s the way it‘s going to have to be done. You're going to have to do just like John L. Lewis had Murray do: Take the Communists to do the job. I'm always glad to be with my friend Jesse because he makes me feel like a young man, and it’s great to feel young. You see, I got in the mills many many years after Jesse Reese; I got in the mills in 1936. And when I heard what he had to put up with between the time he got in and 1936 l felt as if I’d been in there only a relatively-short time. But both Jesse and I-especially I, because I was a little younger—were fortunate to be caught up in a great movement of the people in this country. And that doesn't happen very often in one’s lifetime, but it's an experience that I think is important to anyone who has been able to participate in a movement of this kind. It's indeed a very-important event in his or her life. Because a movement of the kind that we had in the Steel Workers Union and in the CIO was a movement that moved millions of people, literally, and changed not only the course of the working man in this country, but also the nature of the relationship between the working man and the Government and between the working man and the boss, for all time in this country. There are some parallels in the movement today, especially among the young people and the black people, that I won’t go into because I don’t think you ought to be up here too late; but I’d like to speak to you from what little experience I've had personally with this great movement of people in the early 1930s. I was hired at the Inland Steel Company in 1936, as I told you. And I remember I was hired at 47¢ an hour, which was the going rate, and at a time when there were no such things as vacations, holidays, overtime, insurance, or any of the so-called fringe benefits everybody talks about today. But the worst thing—the thing that made you most disgusted—was the fact that if you came to work and the boss didn't like the way you looked, you went home; and if he did like the way you looked, you got a promotion. Anything and everything that happened to you was at the whim and will of the fellow who was your boss and your supervisor. Now fortunately Jesse had a good boss, so you see how grateful were the people in the mill who had a good boss. I might tell you that 99% of the people did not have good bosses. As a matter of fact, in order to get a promotion — and sometimes even in order to work—you had to bring the boss a bottle of whiskey, or you had to mow the boss's lawn, or you had to do something to make yourself stand out from the other people he saw. This was the type of condition that existed as late as 1936 in the steel mills in this region. When the CIO came in, the people were ready to accept a change; and because they were ready to accept a change, it was not a difficult task to organize the people in the steel mills. They were willing to make a change. And thousands upon thousands of them, in a spontaneous movement, joined the steel workers‘ organization at that time. And they did it because conditions in the mill were terrible, and because they had become disgusted with the political set-up in this country and the old tales told by the Republican Party about the free-enterprise system in this country in which any man was his own boss, and there was no sense in having an organization, and organizations and unions were anti-American, and so on. All this fell off the hacks of the people at that time. They realized that there was going to be a change —both a political and an economic change--in this country, and there was. Now Jesse told you a lot about the 1937 strike. John L. Lewis had an agreement with the US Steel Corporation, and they signed a contract. Little Steel—which was Youngstown Sheet and Tube, Republic Steel, Inland Steel, and other independent companies--had no contract with the Steel Workers Union. As a result in 1937 there was a strike called on Little Steel. And one of the things that happened during the strike was the massacre in South Chicago—the same Chicago cops of 1936 beating and shooting the people. The strike was not won;we did not win a contract. Neither Youngstown Sheet and Tube, nor Republic Steel, nor Inland Steel won a contract with the Company. What we did get was an agreement through the Governor’s office that the Company would recognize the Steel Workers Union and the company union and any other organization that wanted to represent the people in the steel industry. And we went back to work with this Governor’s agreement signed by various companies and union representatives in Indiana. At Inland Steel we had a company union; we had our own steel workers’ union. When we got back to work we had company-union representatives and Steel Workers Union representatives, and we had no contract with the Company. But the enthusiasm of the people who were working in the mills made this settlement of the strike into a victory of great proportions. Without a contract; without any agreement with the company; without any regulations concerning hours of work, conditions of work, or wages, a tremendous surge took place. We talk of a rank-and-file movement: The beginning of union organization was the best type of rank-and-file movement you could think of. John L. Lewis sent in a few organizers, but there were no organizers at Inland Steel, and I’m sure there were no organizers at Youngstown Sheet and Tube. The union organizers were essentially workers in the mill who were so disgusted with their conditions and so ready for a change that they took the union into their own hands. For example, what happened at Inland Steel I believe is perhaps representative of what happened throughout the steel industry. Without a contract we secured for ourselves agreements on working conditions and wages that we do not have today, and that were better by far than what we do have today in the mill. For example as a result of the enthusiasm of the people in the mill you had a series of strikes, wildcats, shut-downs, slow-downs, anything working people could think of to secure for themselves what they decided they had to have. If their wages were low there was no contract to prohibit them from striking, and they struck for better wages. If their conditions were bad, if they didn’t like what was going on, if they were being abused, the people in the mills themselves —without a contract or any agreement with the company involved — would shut down a department or even a group of departments to secure for themselves the things they found necessary. We made an agreement with Inland Steel way back in ’38 or ’39 that the Company would not pay less than any of its competitors throughout the country. We never had it so good—I assure you of that. All you had to do as a. union representative was come into the Company and say: ‘Look, we have a group of people working in the pickle line, and at Youngstown, Ohio or Youngstown Sheet and Tube in East Chicago people are getting more money than we’re getting for the same job.”And if that was a fact, we were given an increase in wages at Inland. In those departments where you had a strong group of union members, where they were most active, we had the highest rates in the country. We were never able to secure conditions of this kind after we secured contracts. What I’m trying to get at is the spontaneous action of people who are swept up in a movement they know is right and correct and want to do something about. Our union now has a grievance committee of 25 people. In those days there were more than 20 assistant grievers and hundreds of stewards. The grievance committee set-up could handle the affairs of the people on every shift and every tum with every group. Where you did have contracts with the companies (at US Steel, for example), you had a limited grievance procedure. The US Steel plant in Gary-— the largest steel plant of the largest steel company—had a grievance committee of only 11. Where union officials did not take over the union through a contract with the company (as they did with US Steel), you had a broader, bigger, more-effective, and more-militant organization that set an example for unions throughout the country. Where the union and the company got together through union contracts (as at US Steel), you had a smaller, more-restrictive, less-militant union that provided less representation for the people in the null. US Steel has never had a strike so far as I know since the unions organized, where as unions like the Inland Steel union had a whole series of strikes in order to protect their conditions and prevent the Company from taking over or taking back the things they had earned. What happens to a union? And what happened to the United Steel Workers of America? What makes my friend Jesse Reese mad, and what makes me mad, and what makes thousands of other people in the mill mad is that the companies became smart and understood that in order to accommodate themselves to a labor organization they could not oppose that labor organization. What they had to do was recognize that labor organization. And when they recognized a labor union they had to be sure they recognized the national and international leadership of that labor union and took the affairs of that labor union out of the hands of the ordinary elected officials on a local scale. Now Little Steel was not smart. Little Steel had people like the president of Republic Steel, who said he would go out and pick apples before he would recognize the union. And our own dear Inland Steel Company said they would do nothing; they would rather shut their place down forever than recognize the Steel Workers Union. Now what happened to these companies that did not recognize the union—that forced the union to act against the company—was that the workers developed the most-militant and most-inspiring type of rank-and-file organization that you can have. Now when the companies realized that this was what was happening, they quickly saw that they had gone off in the wrong direction, and they recognized the leadership of the union. We used to bargain locally with the Inland Steel Company, and we had our own contract with the Company. We let a representative of the international union sit in, but we bargained right in Indiana Harbor and settled our differences right there. But soon Inland began to realize that this was not the way, because they were up against a pretty-rough bunch of people who had no ambitions to become political leaders and labor representatives on a national scale. They realized that the best way to handle the situation was to work with the international leadership of this union. And today, as Jesse has pointed out to you, the Company and the international leadership get along pretty well. The union has become a watchdog for the company. The local union has become the police force for the contracts made by the international union. If a local union tries to reject a contract in the Steel Workers Union, the contract is put into effect and the local union acts as the police to see that the men live up to the contract, even if it is rejected by the entire committee which negotiates the contract. This is, I think, the normal growth which occurs when labor unions and most other organizations become legitimate and old and part of the general situation of the country. At the same time, I think it important to realize that the growth of the union in this country has changed the bond. We no longer have many of the sweat-shops we had in the ’20s and early ’30s, or the terribly-low wages we had before. The union taught the Systern—taught the industrialists of this country—that it is possible to pay decent wages and provide decent working conditions and still make a fortune. In fact the steel mills make more money now than they ever made before. They do it by paying people a fairly-decent wage and by working people not nearly so hard as they were worked in the past. The union has taught the companies how to make money through recognizing the union organization. And the Government and the employers have learned how to adopt, co-opt, and engulf the union and make it a part of the Establishment. And in making it part of the Establishment they took the guts, the militancy, and the fight out of the people who work for a living. This is what‘s going to happen, I presume, to many of the movements we have going today. I think some 30 years from now one of you young folks will be standing up here making a speech about the peace and youth movements of the early 1970s and what happened to them in the next 30 years. This book and the sequel, "The New Rank and File", are really excellent books. Why? Like "Working" by Studs Terkel, "The Wobblies" by Stuart Bird and Deborah Shaffer, Paul Avrich's "Anarchists" and other oral histories, the voices of those who participated in the events we read about are heard in an unflitered way. The lives they lived, the struggles they fought the fights of old, the mythic times of rough life and even rougher class struggle. They give the human side, the sound of the voice itself, the humanity of the person talking about their experiences. For me, these sorts of reads are far more instructive then dry theoretical tomes. They reflect the trail and tribulations of implementing ideas, the practice. The reality of the fight. Although most Libcom readers would have issues with the politics or even the practices (of working inside the trade unions) of those interviewed. There are many very interesting aspects of the times and struggles of these old timers. And the organic working class syndicalism comes through in many of these interviews, as in the long quotation below. For those of us coming of age, the lessons of the 1920s-1940s were just being discussed in a different light. The introduction, by Lynd, of what was called a "new labor history", that of the rank-and-filer was criticized by the established traditional labor historians of day. The labor establishment was fat, bureaucratic, oft times corrupt, racist and anti-left. The height of corporate unionism was about to fall. It's rise enhanced by the capitalist class. The militant, class struggle of the 1920s, 1930s gave way to a top down unionism that those of us who came to age in the late 1960s and 1970s sought to revive, enhance and move in a revolutionary direction. Criticism's aside, there is much to absorb and learn from the stories told in both of Lynd's "Rank-&-Files" and other similar books. For those coming to the fore in the fights of today, I turn my yellowed pages of Lynd's book to a passage of old. Read, think, absorb and be armed with the knowledge that overcoming challenges are possible, as well as taking on the new challenges as they arise....as they were for the miltants of old. Yeah this is really good. Took me a while to OCR and then reformat from the PDF, but it was worth it. There's quite a bunch more on my Radical America to-do list, also. Thanks for posting much of this stuff. RA was an excellent, non-secarian publication in the better traditions of a radicalized, decnetralist SDS. Thanks so much for posting this, as any tid bit about the old IU 440 is of great interest to me! Awesome collection of personal histories. Thanks again!